p(blue). Editor's note: Check out this author in Culinate's Dinner Guest Blog. Farmers' markets are multiplying across the country, and their stalls are bursting with locally grown produce, artisanal breads and cheeses, and naturally raised meats. 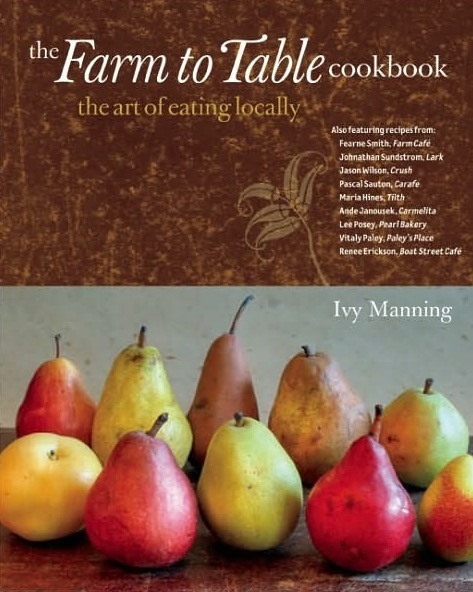 As America's desire for local and natural ingredients continues to grow, Ivy Manning offers this spectacular collection of recipes, including special dishes from some of the most touted Northwest chefs and restaurants — Tilth, Wildwood, and Crush, among others — that have made their marks using the freshest local ingredients. Organized by season, this cookbook invites the home cook to sample such dishes as Fresh Pea and Pancetta Risotto, Seared Scallops with Creamed Ramps and Black Truffles, and Blackberry Hazelnut Crisp. Wherever your market is found, declare your allegiance to the localtarian movement! With full-color photographs and more than 100 recipes, think globally but eat locally with this attractive, sophisticated, and satisfying cookbook.